Bread-Free Wraps – Your Lunchtime Saviour! Bread, bread, bread… what to eat instead???! Finding healthy, tasty, EASY replacements for lunchtime sandwiches and on-the-go bites is by far the biggest challenge for anyone reducing their bread intake. But what if you don’t want a dressing with a zillion ingredients to it? What if you’re not sure it has no gluten lurking in the unpronounceable additives? What if you actually want to choose your own filling?! These wraps are your path to freedom! Freedom to create your own delicious lunches and snacks, knowing you are eating healthful ingredients. Once made, they keep well in the fridge for up to 4 days, meaning you can make up a batch and have them on hand to save you from reaching for the bread loaf. They also freeze well and defrost quickly. Just take them out of the freezer the night before and they’re good to go in the morning. Tip: make up your filling the night before too, so you can grab both as you fly out the door in the morning. If you’re concerned because you’re not a huge fan of cauliflower, please just give these a try because they don’t taste overly cauliflowery! The only thing that makes these wraps too good to be true? They won’t make themselves! Yup, you’re going to have to set aside 30-40 minutes to make a batch. But if you are prepared to do that, I think you will be as converted to them as I am. After all, not only are they gluten free and veggie-based, they have taste! 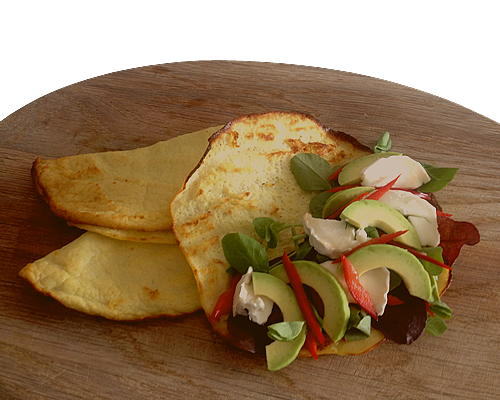 You can replace that floury tortilla wrap or bland white sliced bread with something that actually has flavour. Who knew! This recipe is written with the use of a hand (stick) blender. You can make it with a jug blender. 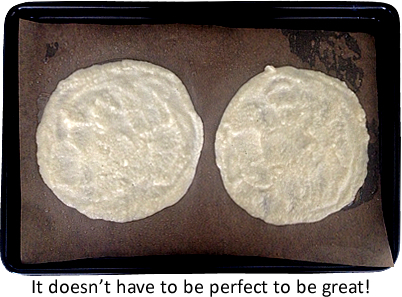 Baking sheets – preferably 2 of them, each big enough to fit two 15cm (6 inch) diameter wraps on it. Magician’s Note: I have been experimenting with the best method to make these for weeks. But honestly, if you have different equipment to me, just experiment because it’s very difficult to get these wrong. My favourite method for this is to chop them up roughly and then transfer to a measuring jug. Then I use my hand blender to really mush it up as fine as possible. Add the 2 eggs to the mushed up cauliflower and keep blending until it’s as fine as you can get it. Add a Tablespoon of olive oil to the mixture and blend again briefly. In the centre of one half of a baking sheet, spoon 2 Tbsp of your cauli mixture. Spread the mixture with the back of the spoon to create a roughly 6 inch round. It will be thin but make sure it’s even and you can’t see the paper beneath. Repeat this to make three more rounds on your baking sheets. Place on two shelves in the oven and bake for 10 minutes. Carefully grab the baking paper with one hand and gently ease your spatula between the wrap and the paper to loosen it from the paper. Work around the edges of the wrap. It doesn’t matter if some of the wrap sticks to the paper, it’s the inside of the wrap anyway. When you have all of the wraps worked loose and free, flip them over on the baking paper and put them back in the oven for another 5 minutes. You can fold them in half at this stage if you like as they are at their most malleable. Once cooled, you can store these in freezer bags. They will keep in the fridge for up to 4 days or in the freezer for longer. 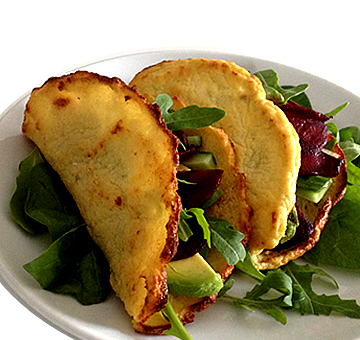 Use instead of flour wraps or bread sandwiches and enjoy with your favourite filling! Please comment below and tell me if you are prepared to invest the time to make these delicious wraps. If not, what would stop you? Juicer Pulp Bread-Free Wraps – Your Lunchtime Saviour! Is Gluten the Culprit of YOUR Health Problem?